This solution creates a custom Amazon CloudWatch metric named VPNStatus. 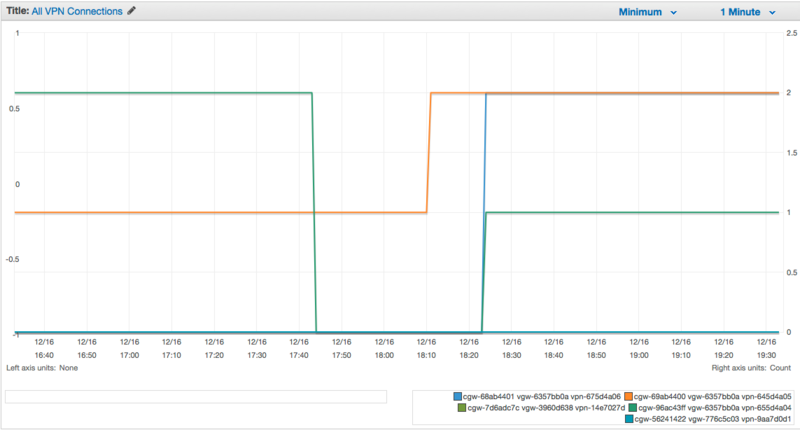 Each time the AWS Lambda function executes, it updates the metric data for each VPN connection in the customer’s account. This data includes the VPN ID, the virtual private gateway (VGW) ID, the customer gateway ID, and the AWS Region where the connection exists. The connection state is recorded as 0 (both tunnels are down), 1 (one of the tunnels is down), or 2 (both tunnels are up). This metric allows users to review the status of each VPN connection and the state of the tunnels in each connection. With this information, you can identify and troubleshoot issues to help ensure that your VPN connections operate correctly. Sign in to the Amazon CloudWatch console. In the Custom Metrics drop-down field, select VPNStatus. Select the VPN connection(s) that you want to view the status of. At the bottom of the page, an individual graph will appear for each connection you selected, as shown in the following example. Note that a value of 0 is a connection with both tunnels down, a value of 1 is a connection with one tunnel down, and a value of 2 is a connection with both tunnels up.